While waiting for the bus after school, Will took a bag out of his backpack. He pulled out a couple CDs and a small remote control car to show off to his friends. The boys were always impressed with the things Will brought to school and some of them were even envious. Trevor walked up just as Will was putting the things back into his backpack. "That sure is some cool stuff you've got there!" Trevor exclaimed. "I wish I had all the stuff you've got." "So you like my things, do you?" Will asked with a sly grin. "I'll tell you what. I'm in a good mood today. I'll give you everything in that bag for a dollar." "WOW!" all the boys exclaimed. They all knew that was a great deal and none of them would have turned it down. Trevor reached into his pocket, pulled out a crisp dollar bill, and handed it to Will. Will in turn reached into his backpack, pulled out the bag, and gave it to Trevor. With great excitement, Trevor opened the bag. His excitement quickly turned to anger. "YOU TRICKED ME!" he yelled. "THERE'S NOTHING IN THE BAG! I WANT MY DOLLAR BACK!" None of the boys had noticed that Will simply dropped the things into his backpack, not placing them back in the bag. Any one of them could have been the victim of his mean scheme. "Nope! I'm not giving you the dollar back!" Will said with a sneer. "You made a deal to buy everything in the bag for a dollar. You keep the bag; I keep the dollar." Will and some of the other boys started laughing loudly. They thought it was a great trick, but it wasn't funny to Trevor. Not only had he been tricked and lost his dollar, but he was also humiliated in front of all his friends. He had a difficult time trying to hold back the tears as he climbed onto his bus, but after all that, he certainly didn't want to let them see him crying. Isaac, very old and nearly blind, knew he was going to die soon. He called his oldest son Esau to his side. "Please get your hunting gear and go get some venison. Then make me some of that delicious meat that I enjoy so much. After I eat, I will give you my last blessing. Then I can die peacefully." 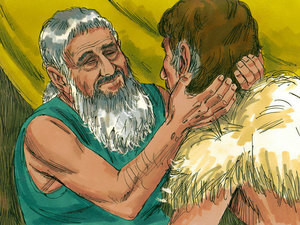 Esau loved his father very much and wanted to please him. 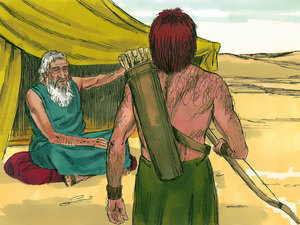 Hunting was what Esau liked best, so he wasted no time gathering his bow and arrows and was quickly out in the fields. 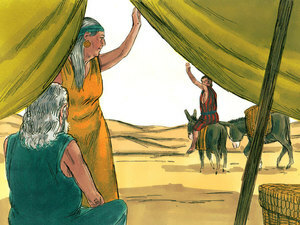 Jacob and Esau's mother, Rebekah, just happened to be standing nearby and heard Isaac's request. Jacob was her favorite son and she wanted him to receive the last blessing, even though the blessing was rightfully Esau's because he was the oldest son. Quickly, she went to find Jacob. "Your father has just asked Esau to bring home venison and cook his special meal. Then he is going to pronounce the last blessing," she explained. "Do as I say and do it quickly before Esau comes back." She instructed Jacob to go to the flock and get two young goats. She then proceeded to cook the meat and flavored it in a special way that she knew Isaac would love. She told Jacob that when the meat and bread were finished cooking, he should take it to his father and pretend to be Esau. "He is nearly blind and it is dark in the tent. He will never know," she said. Jacob protested, "But Mother, Esau is rough and hairy, and after coming in from a day of hunting in the fields, he will be smelly. Surely our father will know that I am not Esau and instead of a blessing, he will pronounce a curse over me!" "Don't you worry about a thing," Rebekah replied. "I have already thought of that." Reaching behind her, she picked up some of Esau's clothes. She also had some animal skins nearby. "Put on these clothes, and then put the animal fur around your neck and on your arms and hands. The clothes haven't yet been washed and smell like Esau, and when your father reaches out to touch you, the fur will make you feel like Esau." Jacob did as his mother told him. "EEW! These clothes sure do stink!" he exclaimed as he put them on. "And this fur is scratchy! I sure am glad I don't have wear this all the time!" When the meat was nice and tender and cooked just right, and the bread was finished baking, Rebekah handed the meal to Jacob. "Here, take this to your father," she said. 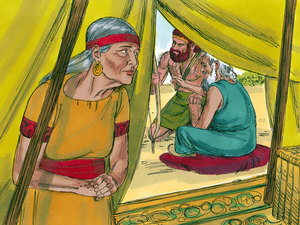 Jacob took the meal and went to the tent where his father was resting. 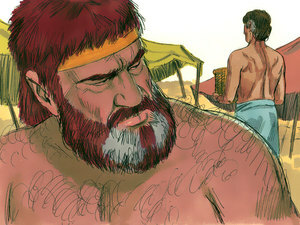 "Father," Jacob said, pretending to be Esau. "I am here," Isaac said, "but who are you? Are you my son Esau?" "Yes, Father. I am your firstborn son. I am Esau. 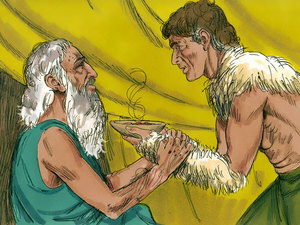 I have done all that you asked me to do," Jacob lied, handing the plate of food to Isaac. "Here, sit up and eat the venison I have made for you. Then bless me." Now Isaac wasn't one to be so easily fooled. "How have you gone hunting, cooked the meat, and returned so quickly?" he asked. "Because the Lord brought the animal right to me," Jacob replied. Isaac still wasn't quite convinced. "Come closer to me," he requested. "I want to feel you to make sure you are my son Esau." Jacob went closer and Isaac felt him. He smelled the clothes. He felt his hands and neck. "Are you really Esau?" he questioned. "You feel like Esau and you smell like Esau, but your voice sounds like Jacob." "Yes, I am he," Jacob lied. "God give thee of the dew of heaven, and the fatness of the earth, and plenty of corn and wine: Let people serve thee: be lord over thy brethren, and let thy mother's sons bow down to thee: cursed be every one that curseth thee, and blessed be he that blesseth thee." This was a very important blessing because it meant that Isaac had just made Jacob the ruler of the entire household. Along with the last blessing also came the inheritance. This meant that Esau and any other children would only receive a little bit, but that Jacob would receive a great portion of all his father's property and goods. 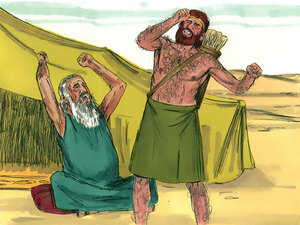 Just as the blessing was finished and Jacob was leaving Isaac's tent, Esau came back from his hunting trip. He had a delicious meal made from the venison he had caught, ready for his father to eat. "Father, I am back," Esau called out. "I brought you the meal you asked me to prepare." Isaac was confused. He thought he had just finished blessing Esau. "Who are you?" he asked. "I am your oldest son Esau. I have just returned from hunting. I have your meal ready for you," Esau replied, not understanding why his Father was confused. 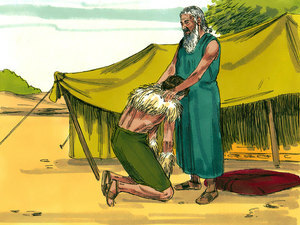 "But I just blessed Esau," Isaac said trembling. "If you are really Esau, who was just here? I just ate my meal and gave my last blessing to the person who just left my tent. I cannot take that blessing back. I have blessed him, and he shall be blessed." Esau was deeply distraught. He knew exactly what had happened. His brother Jacob, to whom he had sold his birthright for a pot of stew many years earlier, had found a way to receive the last blessing. He was upset and angry with Jacob, but that would have to wait. He cried and begged his father, "Please bless me, too! I am the oldest. Jacob stole my blessing. Don't you have even a small blessing left for me?" Isaac answered thoughtfully, "I just made him ruler over all that I have and I made him the ruler over all his brothers, including you." Esau wept uncontrollably because receiving the father's blessing was the most important thing in the world for the oldest son. "Thy dwelling shall be the fatness of the earth, and of the dew of heaven from above; and by thy sword shalt thou live, and shalt serve thy brother; and it shall come to pass when thou shalt have the dominion, that thou shalt break his yoke from off thy neck." This meant that even though Jacob would rule over him, he would eventually become stronger. Esau left his father very sorrowful that he had missed the blessing, and carried with him a deep hatred for his brother Jacob. He determined that after his father died, he would kill Jacob. Rebekah heard about the threats Esau made against Jacob, and his hatred was so great, she had no doubt he would try to follow through. She had a talk with Jacob. "Your brother is outraged that he didn't receive the proper blessing. He has threatened to kill you. You must leave until your brother calms down." Rebekah then talked to Isaac. 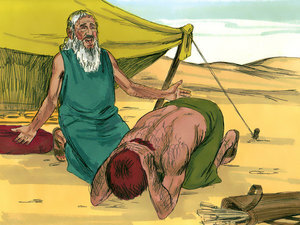 "Please send Jacob to visit my brother Laban. Esau has married women from this country and I don't like them. I don't want Jacob to marry a lady from around here. Please send him to Laban to find a wife." "God Almighty bless thee, and make thee fruitful, and multiply thee, that thou mayest be a multitude of people; and give thee the blessing of Abraham, to thee, and to thy seed with thee; that thou mayest inherit the land wherein thou art a stranger, which God gave unto Abraham." In that prayer, Isaac was asking God to bless Jacob and give him many descendants, just as God had promised Jacob's grandfather, Abraham. He also prayed that the land of his Uncle would become his. Jacob was not happy about leaving his home and his family, but he knew that his life was in danger if he stayed. He gathered the things he thought he would need, loaded a few camels, and started his journey to Padan-aram to visit his Uncle Laban. Unfortunately, this part of Jacob's story doesn't have a happy ending. He paid a high price for his deceitfulness. The day Jacob left home was the last time he saw his mother whom he loved so dearly. 1. Why did Isaac send Esau hunting? 2. How did Jacob disguise himself? 3. Did the trick work? 4. Which brother received the important blessing? 5. What did Esau threaten to do? 6. Why did Jacob have to leave home? Lies, deceit, and trickery are hurtful and only bring trouble in the end. "Lie not one to another" (Colossians 3:9a). to ask You and others to forgive us. Copyright © 2018 by Linda Sue Pochodzay Edwardss.